Palm Jumeirah shopping is getting better all the time and here are few local choices to choose from. Golden Mile Galleria. Here you will find an array of retail outlets including a large Spinneys for all your grocery needs and also coffee shops such as Tim Horton’s and then a good range of other retail outlets. Easily accessed with underground parking. There are several small convenience stores located in the Shoreline developments. You will find emergency supplies at Al Basri, Al Hatimi and Al Msalli. Milk and Honey can be found at Al Das. 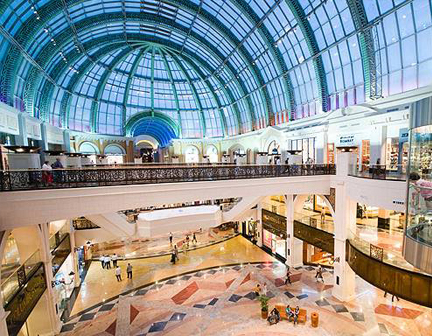 Shopping is one of the biggest tourist attractions in Dubai with the city often being regarded as the ‘Shopping Capital of Middle East’. Dubai offers everything from souks and traditional markets to the largest modern shopping complex in the world. Dubai’s souks offer a shopping experience with sounds, sights and aromas that take you back through history. The Spice Souk (Al-Sabkha Road) is a major tourist attraction and the Gold Souk (Sikkat al-Khali Street) offers fantastic deals on gold necklaces, rings, bangles, earrings etc with some of the lowest gold prices in the world. The Dubai Mall (located in the Downtown area) is the largest shopping mall in the world with a space equivalent of 50 soccer field. It offers 1,200 retail outlets, 160 food stores, an Olympic-sized ice-skating rink, an indoor aquarium, a 22 screen Cineplex and a Hamley’s toy store. Equally as impressive is the Mall of the Emirates, located in Barsha which features more than 560 international brands and the iconic Ski Dubai – the Middle East’s first indoor Ski resort and snow park.